I learned the game of handball at the Downtown YMCA. Located just south of the likewise doomed Downtown YWCA, it too sits on demolition's death row. The limestone building to its left, also condemned, is the former Detroit College of Law where many of the regions top lawyers received their education. 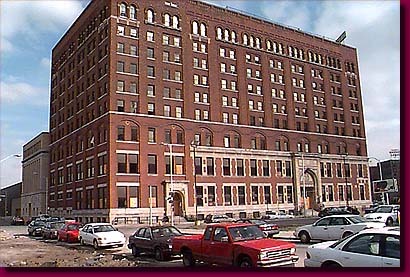 Long a landmark of downtown Detroit, the Downtown YMCA was the region's first YMCA and long the headquarters for that organization. Allowed to fall into disrepair as the organization abandoned Detroit for the suburbs, it was sold for a mere five million dollars to the stadium development authorities.